Big Time Rush is a Nickelodeon sitcom about the lives of four teenagers who are thrust into fame's spotlight after being chosen to become the next big boy band. Over 50 episodes have been produced, making it one of Nickelodeon's longest-running and most popular programs. The core cast is made up of James Maslow, Carlos Pena, Kendall Schmidt and Logan Henderson. The name of the boys' band, Big Time Rush, also provides the show's namesake. When they were signed to produce the show, the boys also signed a legitimate, real-life record deal through which they have released two full-length albums and several singles. The show debuted on Nickelodeon in January of 2010 and has become one of the channel's most successful shows. It is currently in its third season, airing new episodes every Monday at 7:30 p.m. eastern time. Average episodes run 30 minutes long, but a few special events like the pilot episode have warranted 60 minute run times. The plot of the show itself is very whimsical; it shows the boys working through a variety of issues, including dealing their overbearing and self-righteous record producer, Gustavo, trying to write quality music to please their record label, and battling through relationships, all while still attending school and trying to make good grades. In the show, the boys are former hockey players and must also learn how to cope with their new-found fame and how to adjust to the new, foreign world of stardom. The show does this through the lens of humor and does an excellent job of making each member of BTR a unique character. After its second season, the franchise spawned a full-length movie that premiered on Nickelodeon on March 10, 2012, attracting over 4 million viewers. Entitled "Big Time Movie," it depicts the four boys taking a crack at espionage as they embark on a quest to save the daughter of an MI6 agent. Big Time Rush has garnered many awards throughout its lifetime, both as the show and as the band. The show has been nominated for "Favorite TV Show" at Kids' Choice Awards in several different countries, winning the category in the 2011 Kids' Choice Awards Mexico, among others. The band won "Favorite Musical Group" at the 2012 Kids' Choice Awards as well as the 2012 Teen TV Awards. 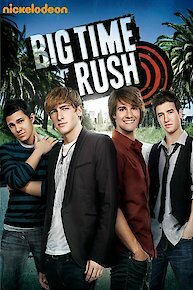 Big Time Rush's first album, BTR, reached as high as the third spot on the Billboard 200 and sold over 500,000 copies. The guys get nominated for a Tween Choice Award and are scheduled to perform at the ceremony, but the evening takes an unexpected turn. The guys are afraid they'll follow in the footsteps of doomed boy bands before them and break up after their third album, so they become desperate to find solo gigs. The boys agree to appear in a video game, but accidentally wind up in a news story about extraterrestrials. Logan reconsiders his dreams of becoming a doctor after Carlos scores higher on the MCAT. James buys a motorcycle to impress Lucy, but doesn't even know how to drive it. Meanwhile, Kendall teaches Jo how to drive a stick shift; and Carlos and Logan are unwilling to give up a piece of childhood memorabilia. Palm Woods' prank wars kick off again, and this time the kids take on the adults. How the guys behave on their tour bus as they make their way to their next gig. The band makes a cameo appearance on a children's show; Kendall's lacks in the acting department; Carlos pursues the show's teen star; Logan and James clash. The boys blow their bonuses immediately. Kendall, Logan, and James get caught up in a web of lies. Lucy makes a hit album based on her breakup with Kendall. Elsewhere, James starts a rumor about recording a duet with Cher Lloyd. In the fourth-season opener, the guys become concerned about competition from British boy bands. They look to hire a new music manager to solve the problem, but they clash over whom to hire. The boys accidentally damage the tape with their last episode, so they quickly put together a blooper/outtakes episode. Kendall and Logan volunteer at a dog shelter and end up adopting 12 dogs, but a sneaky heath inspector is on to them. Carlos and Jennifer's puppy love is sickening and it's up to James and the other Jennifers to rescue them. It's time to go camping. Kendall buys Jo a necklace, while Camille believes Logan got it for her. James and Carlos try to play BTR's Gold Record. Kendall and Logan must tend a wild rocker who's getting inducted into the Rock and Roll Hall of Fame, while James and Carlos babysit Katie. A surprise visit from Jo forces Kendall to choose between her and Lucy. Elsewhere, Carlos and James' friendship faces a challenge. Jo returns from filming overseas to see Kendall. The boys disapprove of Griffin's new line of Big Time Rush merchandise and try to ruin his sales plan. Instead, they end up complicating matters. Kendall goes out with Lucy and her parents. Meanwhile, Logan has an ulterior motive for going on a blind date; and James helps Carlos out with his big night. When Gustavo moves the boys to Bel-Air, they are unhappy with the confinements of their new ritzy lifestyle and make plans to return to the Palm Woods. The get back from their world tour and are now well known and recognized at the Palm Woods. They just want some time to focus on girls. It's BTR's final stop on their world tour and we go behind the curtain and see all the craziness that happens backstage. Mixing in real concert footage, we see the guys prepare for the show and deal with backstage drama at the same time. *Song & Video: "Love Me, Love Me"
Big Time Rush is currently available to watch free on Nick and stream on Nickelodeon. You can also stream, download, buy, rent Big Time Rush on demand at Amazon Prime, Amazon, Hulu, Vudu, Google Play, iTunes online.